Sister Imre serves residents at the St. Macrina Home in Máriapócs, Hungary. In 1991, 14 surviving Basilian sisters — including Imre Ágota, now mother superior — returned to their monastery in Máriapócs. Today, only 7 remain, and of these only 4 are active. The community, like other Hungarian Greek Catholic religious communities, has had difficulties recruiting novices. Several women have tried community life, but each one soon left. The sisters hope and pray for more novices, but if none enters, the simple passing of time will accomplish what 40 years of Communist anti-religious policy could not. In recent years, Hungary’s declining birthrate and aging population have strained the economy, which is still recovering from the transition from a controlled to a free market system. With this in mind, the sisters have devoted themselves to caring for their peers — the elderly — who are poorly served by the state system. Once they restored their monastery, the sisters went straight to work. In 1992, they bought a building behind the monastery and opened St. Macrina Nursing Home, a 25-room room facility for elderly women. Despite challenges and setbacks, the sisters have remained hopeful. “I am retired,” Sister Imre Ágota laughed, describing her typical day of work and prayer, which begins at 5 a.m. and ends as late as 11 p.m. Still, she is already thinking about another project: returning to teaching. “My heart beats for it,” she said. That tireless spirit of hope renews so many who live and work in CNEWA’s world — and it’s one reason why Sister Imre is a CNEWA hero. The Rev. Daniel Lenz leads a prayer for the newly inaugurated Omaha Byzantine Catholic Community in Omaha, Nebraska on 26 June. Father Lenz is biritual, meaning he was ordained for the Latin rite but is permitted to celebrate Byzantine liturgies as well. The Omaha Byzantine Catholic Community in Nebraska seems off to a good start with two baptisms since its official inauguration as an outreach of the Byzantine Catholic Eparchy of Parma this past spring. The new Eastern Catholic community is the result of a grass-roots effort begun about 18 months ago by Catholic layman Matthew Willkom. Within this short time, the Omaha community went from having monthly prayer services on a weeknight to finding a biritual priest who currently celebrates Sunday Divine Liturgy with them once monthly. About 60 people are associated with the community, though about 20 people attend regularly. The 36-year-old radio producer moved to Omaha with his wife and three children four years ago from Minneapolis, where he first encountered the Byzantine Catholic Church. Though a Latin Catholic, Willkom became a regular at the Byzantine parish there and, after living in Omaha for more than two years without a Byzantine liturgy, decided to start a Byzantine community. “I was missing (the Byzantine liturgy) so much, I felt like something should be done,” he told Horizons, the eparchy’s newspaper. For a year, the community prayed on a weeknight at a Ukrainian parish on Omaha’s east side. The pastor agreed they could pray in English with Ruthenian chant. Now-retired Bishop John M. Kudrick of Parma had lent the fledgling group support in the form of liturgical books, as well as guidance from Father Bryan Eyman, the eparchy’s director of missions and outreach. However, in January, the community found a new location — the monastery of the Poor Clare sisters on Omaha’s west side — where biritual Benedictine Father Daniel Lenz currently celebrates Divine Liturgy one Sunday per month. “Biritual” means he was ordained for the Latin rite but is permitted to celebrate Byzantine liturgies as well. People come from all over Omaha and from the Lincoln, Nebraska, area, which is about 40 miles away, said Willkom. Father Eyman visited the Omaha community 24 April. After celebrating Divine Liturgy for about 60 people and inaugurating the outreach, he spoke to them about the steps in becoming a canonical mission. The most important steps are developing commitment and stability in numbers and attendance, and getting finances in order, he said. Eventually, members hope to establish a mission on Omaha’s west side, which is currently experiencing significant demographic growth, with young families moving into the middle- to upper-class suburb from the inner city, said Willkom. He said there are currently no canonical Ruthenians residing in Omaha, but the recent news that a Byzantine Catholic couple from St. Nicholas Byzantine Catholic Parish in Munster, Indiana, intends to join the outreach once they move to Omaha this summer is encouraging, he added. Their presence “will provide some stability and connection with the larger liturgical and spiritual life of the eparchy,” Willkom said. The outreach also is working to establish weekly Byzantine services by the fall. Omaha’s Latin-rite Catholic archbishop gave one of his deacons permission to receive the necessary formation to lead the outreach in a Typika service — known as a Communion service in the Latin Church — on the Sundays when the priest is not available. “We’re all very new to this,” he said. “The bottom line is that we’re looking for encouragement from the eparchy, and Father Bryan’s visit certainly symbolizes that. “We’re also looking to focus on evangelization, on showing the mercy of God to each other, that same mercy we repeatedly proclaim and beg for ourselves in the Divine Liturgy,” he said. The outreach is open to serving all Byzantines, he said. To date, they have reached out to Melkite Catholic refugees from war-torn Syria and Iraq, who continue to make their way to the Omaha-Lincoln area. In a liturgy packed with rich symbolism and ancient tradition, the Holy Protection of Mary Byzantine Eparchy of Phoenix celebrated the enthronement of Bishop John S. Pazak as its fifth bishop. Archbishop William C. Skurla of the Byzantine Archeparchy of Pittsburgh, and a former bishop of the Phoenix-based eparchy, prayed the words of enthronement over the new bishop during a Divine Liturgy that took place at St. Helen Catholic Church in Glendale 20 July. The Byzantine Catholic Church is one of the Eastern Catholic churches in full communion with Rome. Bishop Pazak, who spent the past 15 years as the bishop of the Ss. Cyril and Methodius Byzantine Eparchy in Toronto, processed to the front of the church followed by Archbishop Skurla and Archbishop Christophe Pierre, the apostolic nuncio to the U.S. Bishops and clergy from across the country — including Bishop Thomas J. Olmsted and Bishop Gerald F. Kicanas, who head, respectively, the Latin-rite dioceses of Phoenix and Tucson — also attended along with Catholics from throughout the eparchy. “Receive this pastoral staff with which you are to watch over Christ’s flock that has been entrusted to your care,” Archbishop Skurla prayed at the enthronement. The congregation responded with cries of “Axios! Axios!” — Greek words meaning “he is worthy.” Throughout the liturgy, almost entirely chanted, there were echoing refrains of “Lord have mercy” and “God grant him many years.” Archbishop Skurla then escorted Bishop Pazak to the throne, officially taking the reins of the eparchy. 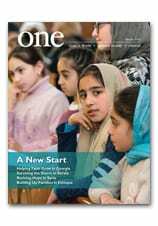 In the Winter 2015 edition of ONE, writer Joyce Coronel and photographer Nancy Wiechec offered a fascinating glimpse into another Church of the East flourishing in the American southwest, the Chaldean Church. Check it out. A policeman reacts as he secures a position in front of city hall after two assailants killed 85-year-old Father Jacques Hamel and took five people hostage during a weekday morning Mass at the church in Saint-Etienne-du-Rouvray, France, near Rouen on 26 July. When he was named Archbishop and Latin Patriarch of Jerusalem in 1987, Michel Sabbah made history. He was the first non-Italian to hold the position. But he knew the region intimately, growing up in a Palestinian Christian family in the hometown of Jesus, Nazareth. We pray for peace and justice in our Holy Land which has been bathed in the blood and the torment of its children for many years, but particularly in these last two years. First, we address our children in Bethlehem — all the Palestinian people. We say to them: We are living your ordeal and we understand your torment. We understand why you ask us how it is that we can celebrate Christmas, its joy, its message of salvation, in the midst of this humiliating ordeal, of ransacked homes, of children who are killed and imprisoned? To you we say: In spite of this ordeal, your dark night, and in fact because of it, we will continue to announce to you the joy of the Savior who has been born for the salvation of all. We invite you to contemplate the Savior to reflect on God and his eternal Word. We invite you to gaze upon the spirit, which is the revelation of the kindness and love of God, in order to renew your faith in God and in mankind. In spite of all misfortune which surrounds you, there are men of goodwill, there is goodness in humanity and in all people. This goodness will finally overcome evil. We also say to you who are suffering this ordeal and this dark night, to prepare yourselves for love and for forgiveness. The love in your hearts will save you and render you just — the love for God and for those who cause you torment. For it is when each one discovers the face of God in his adversary that justice and peace will be established. During his years as patriarch, he served for a time as International President of Pax Christi, spoke out in support of Palestinian rights and called for an end to Israeli occupation. His efforts on behalf of peace and justice in the Holy Land have continued after his retirement in 2008. He works closely with the Equestrian Order of the Holy Sepulchre of Jerusalem and in 2009 launched Kairo Palestine, a movement advocating for the end of Israeli occupation and a just solution to the crisis in his homeland. His concern and love for all those who suffer in the land we call “holy” marks Michel Sabbah as a kindred spirit and close collaborator of CNEWA — and, indeed, one of our heroes. Just miles from the demarcation line separating these families from the forces of hate that have engulfed the region in a whirlwind of bloodshed, the cardinal and his delegation — which included CNEWA board member Bishop William Murphy of Rockville Centre and CNEWA’s president, Msgr. John Kozar — demonstrated CNEWA’s solidarity with the displaced and those committed to their care. Read more and see a gallery of images in the Summer edition of the magazine.